This is the first painting I finished after Naomi was born, a composition I worked on over several months, well, really over a year in fits and starts. I shared progress on this painting here and here. I got to work on it in September when my mom was visiting, she took care of Naomi while I got to paint! At the time, I was not sure if it was totally complete or if a few more areas needed to be tweaked, so it has been sitting out for me to decide. Last week I realized I am pretty happy with it as it is and now call it finished. The flowers are dried alyssum, I love the small delicate pincushion shape of the flowers when they are still green and in the garden, but when they dry out they become filmy and lace-like, providing a nice contrasting texture to the smooth surfaces of the eggs and glass bottles. 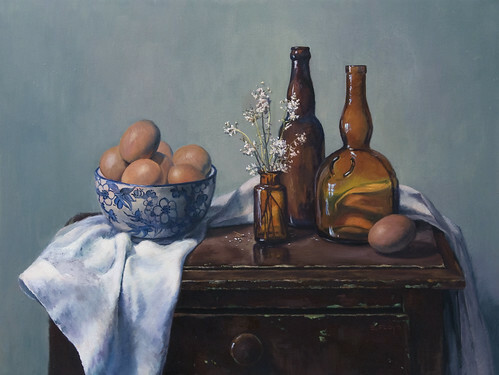 Now that the painting is finished I realize the setup is a study of surface texture, smooth and shiny (the bottles), smooth and dull (the eggs), delicate touches and rough areas on the table where paint is chipped off and worn. Most times I know why I want to paint a scened, however sometimes I do not realize what draws me and inspires me to paint, I just want to. This was one of those paintings.